The below artworks are the most important by Barbara Hepworth - that both overview the major creative periods, and highlight the greatest achievements by the artist. Artwork description & Analysis: One of Hepworth's earliest near-abstract works - moving far afield from the much more figurative modes of Brancusi's strong influence on her - was a piece destroyed in the German bombing of London in WWII, while Hepworth was living in Cornwall. It remains an important work nonetheless. Its dominant feature is a hole in the center of the sculpture. For the first time, Hepworth's work is concerned with a manifestation of absence rather than presence. The viewer becomes aware of the volume of empty space, and the powerful resonance this can create. The work makes manifest the fundamental underlying principle of carving; that form and volume are created by taking away material, not adding it, distinguishing it from almost every other art form. 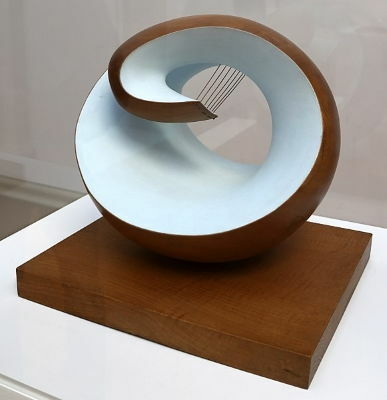 Hepworth's idea of a pierced form was taken up immediately by Henry Moore, her friend and rival, and would inform the practice of both artists for years to come. Hepworth's first "piercing" of a figurative sculpture of her own came after apparently misunderstanding the description in a review of Moore's work. And the two artists developed this pursuit of sculptural absence in parallel to one another over many years. This motif was important in laying the groundwork for the particular aesthetic that would come to be associated with Moore and Hepworth. Hepworth said of this work, "I had been seeking a free assembly of certain formal elements including space and calligraphy as well as weight and texture, and in the Pierced Form I had felt the most intense pleasure in piercing the stone in order to make an abstract form and space; quite a different sensation from that of doing it for the purpose of realism." Artwork description & Analysis: Hepworth made several mother and child sculptures in 1934, when she was pregnant with Ben Nicholson's child (it actually turned out that she had triplets). Made out of a single piece of alabaster, but with two separate sculptural elements, the work consists of a reclining "mother" and a "child" resting on her thighs. Although it has abstract elements, the form is biomorphic and the title points to a figurative interpretation. Hepworth's contemporary and friend Henry Moore was also making mother and child pieces at this time, but while Moore's composition tended to be made as single form, Hepworth saw her mother and child as separate, but intimately involved, entities. She once stated that "there is an inside and an outside to every form, [and sometimes] they are in special accord, as for instance a nut in its shell or a child in the womb." This sculpture represents the partnership after the child has been born, but ideas of a "special accord" and a formal link are still present. The 'child' sits high on the mother's leg, revealing a hollow at the mother's stomach and a characteristic hole, implying a correlation of the two forms. The effect, somewhat surprisingly, is one of completeness. Artwork description & Analysis: Although the form of Pelagos is emphatically abstract, it was inspired by a view of the coast at St Ives in Cornwall, where Hepworth lived from 1949. "Pelagos" means "sea" in Greek. Hepworth undertook a practice of "direct carving," allowing the physical make-up of the wood to direct her chisel. The final shape recalls a wave or the curve of a headland. The inside is hollowed out and painted blue. The emphasis placed on the interior of the shape recalls Hepworth's experiments with holes and pierced forms, but here her ideas are taken a step further. The art historian A.M. Hammacher argues that the characteristic 'hole' of Hepworth's earlier work has taken control and "mastered the interior and even broken it open." The form is also pierced with small holes and fretted with strings in a way that is reminiscent of a musical instrument. Hepworth said that these taut strings represented "the tension I felt between myself and the sea, the wind or the hills." Pelagos feels at once still and dynamic; it is presented both as a perfect harmonious form and as a coiled spring balancing precariously, waiting to unfurl. This sculptural tension, which Hepworth relates to her personal experience, makes the work simultaneously calming and unsettling for the viewer. Artwork description & Analysis: Although Hepworth is known primarily for her sculptural work, she was also skilled at draftsmanship and produced many sketches, drawings and mixed media works over the course of her career. Her daughter became ill in 1947 and while she spent time in hospital, Hepworth began to observe surgical procedures and to draw what she observed. There is something almost religious about the way the hands and features of the surgeons are illuminated in Concentration of Hands II. Hepworth's sweeping pencil strokes obscure the blood and gore of surgery and instead exalt the work of the anonymous doctors. They contain visual references to various figures from art history, recalling Piero della Francesca's use of light and Rembrandt's The Anatomy Lesson. 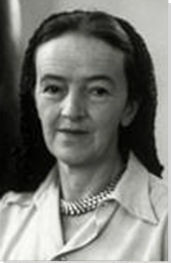 Hepworth saw something pure and classical in the process of surgery. She stated: "From the very first moment I was entirely enthralled by the classic beauty of what I saw there; classic in the sense that architecture and function were perfectly blended and purity of idea and grace of execution were in complete harmony." She also saw clear parallels between the work of the surgeon and the work of a sculptor like herself. 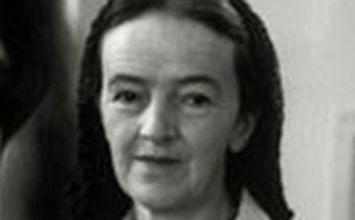 Artwork description & Analysis: After her son Paul was killed in a Royal Air Force plane crash over Thailand in 1953, Hepworth's work was significantly interrupted. She was taken to Greece by a friend in an attempt to distract her while hopefully eventually inspiring her to be productive again. On her return to England, she started to sculpt again and produced a series of works named after places she had visited, including Corinthos, which is the first and largest of these. The piece is carved from Nigerian guarea, a tropical hardwood that had been in short supply in England since the outbreak of WWII. It is a sculpture on a monumental scale, measuring over three feet in width, depth and height, and weighing over 900lbs, unusual for Hepworth's oeuvre up to this point, and for sculptural work in wood more generally. Corinthos is arguably Hepworth's masterpiece in terms of her interest in the interaction between interior and exterior forms. The hollowed-out core, painted cream, offers a sharp contrast to the dark, shining and sensual wood exterior. The painted interior emphasizes the effect of light on the sculpture, as the light enters and emerges through various holes and openings. The work defies a single ideal viewpoint, as different vistas in the sculpture open up, depending on the angle from which the viewer examines it. Hepworth was aware of this, and noted the consequent difficulty of photographing the work: "It is a very difficult one to [photograph] well, due to the relation of inside and outside carving, i.e. if you get all the outside, you hardly see the inside." Artwork description & Analysis: Squares with two circles is one of Barbara Hepworth's most significant later works. She started working with metal in 1956, which allowed her to create larger pieces like this. The piece's title and initial aesthetic hint at a simple geometric composition, but the shapes are not rigidly accurate; the angles of the squares are not quite 90 degrees and the face of the sculpture is subtly convex. As Nan Rosenthal argues, "despite the sculpture's geometric syntax, a sense of the natural and vital is preserved." These nuanced irregularities give even this - her work most formally simple in terms of shape - distinguishing it from superficially similar geometric sculptural work by her contemporary David Smith. 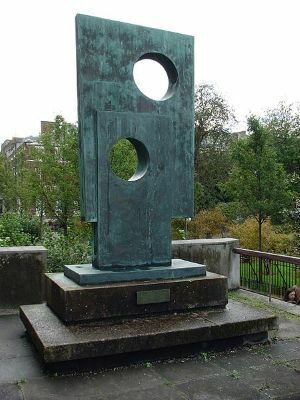 The "circles" of the title are, characteristically of Hepworth, holes in the sculpture. As in one of her earliest works, Pierced Form (1932), she draws attention to the sculptural forms created by absence as well as presence. Many of her works, including Squares with two circles, are intended to be situated outside. She was preoccupied by sculpture's integration into the landscape, and she achieves this here by allowing the work's setting to be seen through the circular openings. Referring to Squares with two circles, Hepworth wrote that she was "interested in the proportion of the sculpture in relation to the human figure, and the apertures are placed in relation to human vision." Despite its geometric composition, this work provides the viewer with an opportunity to consider the relationship between sculpture, the human body, and the landscape. Artwork description & Analysis: The eye can trace the intertwining curvilinear spirals endlessly through their moebius strip flow in this sculpture. This tracing process generates not so much a static form as an elegant dynamic fluidity, as suggested by the reference to a classical form of dance in the piece's sub-title. A later work in her ouevre, her use of the humble material of plaster here was actually among her earliest resources for sculpting. Hepworth's uncle was a General Practitioner, and he provided her with plaster that he used as casts for broken bones dating back to the first decades of the century, including some of her first sculptures and then continuing on throughout her career for its utility for model-making as well as fully-formed sculptural works in themselves. The rough sheen of the work's surface holds out hints of natural formations, while the form itself allows particularly open glimpses through the sculpture to the setting beyond, combining Hepworth's continually development achievements of combining materials and absence to make forms that both speak of nature while distilling essences of underlying organic shapes.